The Old Mill Herbary with Mini Arboretum, Mill-leat, bog-garden Camomile lawn around Greek fertility theme with named planted displays, unusual herbs, trees, shrubs of botanical historic interest. The Old Mill Herbary is located in an idyllic valley setting, with about 3 acres of semi-wild terraced gardens on a steep south facing bank. There are mature woodland walks interspersed with several islands and bridges alongside the unspoilt River camel, now an S.S.S.I and S.A.C. 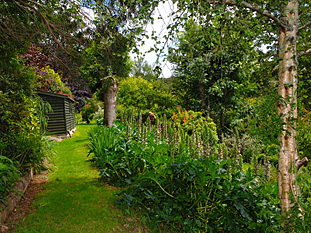 The mini arboretum of approximately 1.25 acres, is planted with over 40 named unusual trees, in a small level meadow adjoining Helland Bridge, which is listed in “The Patent Rolls” of 1381. Finished c.1415, Helland is one of the best 14th Century medieval bridges in Cornwall, notable for its 4 pointed arches springing from water level, and rounded arch for leat. In the Great Flood of 16th July 1847, caused by a waterspout on Davidstow Moor, the ensuing flood water sped down the Camel valley some 12-18 feet high, and all the bridges, with the exception of Helland Bridge and Wadebridge were swept away. Research has established that Helland Bridge, with its adjacent water mills, were part of the Colquite Estate and are mentioned as early as 1585, when the rent was 2/- per annum. There was a hop yard of 1 acre here in September 1653, with an orchard and herb garden in August 1775. The Mill was fed by the leat with help from the river in summer. Signs of this are still evident by the large stones in the river at the top of the woodland islands. The mill was powered by an undershot wheel and was used for grinding corn and sawing wood. This was in use until around 1934, being demolished approximately 1939, but various relics and several large granite “clapper” stones, troughs and mushrooms have been found and may be seen, together with the large granite cider press, now a fountain. 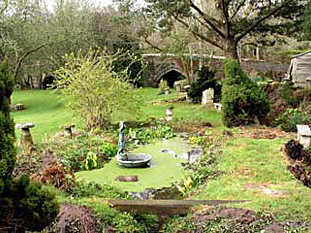 The leat, fed by a natural spring, has been cleaned and restored, feeds natural bog and water gardens, passing under the renovated Granite Clapper Bridge. 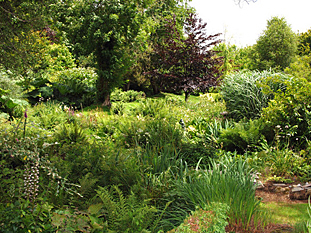 The many semi-wild gardens give home to an enormous variety of named planted displays of culinary, medicinal and aromatic herbs, unusual and rare species of wild flowers, shrubs, trees and climbers. A gentle stroll along the terraced pathways of this semi-wild garden brings one to the woodland area, which in springtime is carpeted with wild daffodils, primroses, wood anemones, bluebells, and latter, many varieties of ferns. Heading back towards the House, c.1820, along the lower path by the leat, brings one to the bog and water gardens. Here on a terrace can be found a well established Camomile lawn, whose spicy fragrance wafts aloft when trodden underfoot. On the patio is a large pond, stocked with a variety of water plants, there are herbs and plants for sale. The gardens have been a continuous, ongoing process, have been created entirely by the owners themselves since 1984, and have been open for over 17 years. They attract visitors from from the UK and overseas, including Research Chemists, Herbalists, Universities, Journalists, gardeners and garden Clubs. Much time and effort has been spent creating and expanding natural and unusual features around a Greek Roman Fertility Theme; with a rich variety of plants to encourage the natural flora and fauna. Many butterflies and insects abound in summer, together with many interesting birds and occasionally otters. There is a constant quest to find new and rare species, particularly those of medicinal interest, to suit the ever growing plant collection which reflects the concern felt by the owners for the conservation of the environment in which they live.